Virtual Agent: Hi there, and thank you for contacting Some Wireless Company. How can I help you today? You: My phone stopped working, so I’d like to replace it with a new one. Virtual Agent: It sounds like you’re trying to activate a new phone, is that right? You: Well, I need a replacement first. But eventually, sure. Virtual Agent: Thank you. I’ll connect you with Sales, so they can set up your new account. You: Wait, what? I already have an account. I just need a replacement ph—! In a given year, it’s estimated that people in the U.S. spend more than 900 million hours on hold—navigating menus with their keypads and voices, or just waiting for answers to their questions. And the situation doesn’t seem to be getting any better. Part of the challenge is that many companies build their answering systems the same way they did 30 years ago—with gut feelings and guesswork. While this may work for basic questions like "What's my account balance?”, it quickly breaks down for more complex customer needs. We're building Chatbase because we’re convinced there's a better way. Chatbase is a project in Area 120, Google’s workshop for experimental efforts, and we recently launched a new offering that helps businesses improve their automated voice and chat systems. By analyzing a company's agent-customer transcripts, Chatbase can now help design virtual agents that are more helpful and versatile, and even improve over time. And yes, they know that sometimes you still want to speak with someone. 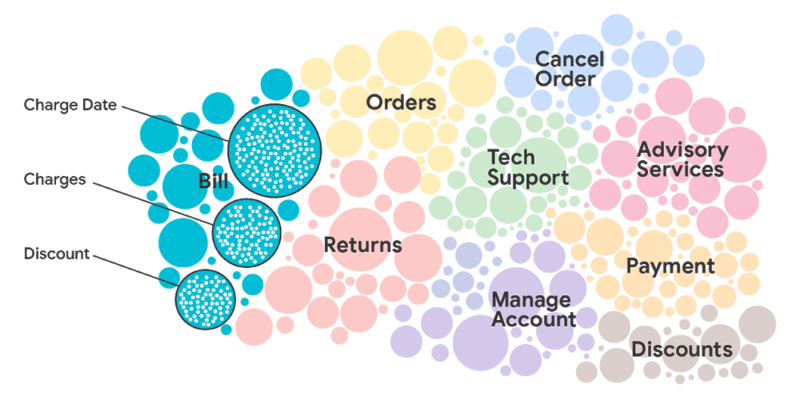 A visualization of how Chatbase analyzes agent-customer transcripts, and categorizes the types of support customers ask for.